When the call comes in that Mike Wilson, the unlikable owner of West Branch Lodge, has gone missing, Sheriff Tully is delighted. This is an excellent opportunity for Tully, his tracker pal Dave, and his retired sheriff father, Pap, to enjoy a few evenings of hot tubs and single-malt scotch at the luxurious lodge while working the case. 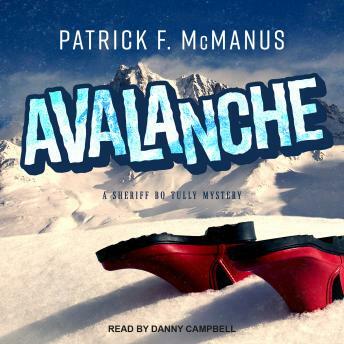 However, visions of R & R vanish in a flash on the drive up, when Tully and Pap suddenly realize an avalanche is thundering down the mountain, straight toward them. Tully manages to outrun the crush of snow, but the road behind is blocked, and there's no telling for how long. Tully's stranded at the lodge with a motley group of vacationers and locals: a sassy co-ed, a group of rambunctious fraternity boys, a shadowy group of what looks like ex-cons, the missing owner's wife, a suspiciously good-looking bartender, and worst (or perhaps best) of all, Tully's old flame, who shows up with her dogsled and naughty intentions. Both vacationers and locals start to look like suspects when Tully discovers startling evidence proving that the avalanche was no accident of nature. But why would anybody want him dead? And then the missing persons case turns into a murder case when Mike Wilson's body turns up in the river a couple of days later.